The Farmer, follows the Father of StoneVale (FoS for short) across a long and narrow bridge connected two cliffs. Looking down in an abyss, sounds of beasts seem to echo in deep elongated moans underneath. The bridge appears to be weak, rickety and swaying back and forth minutely with each step. Fully trusting the Second Pillar Father of StoneVale, yet not fully trusting the bridge, the Farmer times his steps antithetical to his General, in a way to mitigate the swaying, hoping the bridge holds steady. In almost a comforting way, he is pleased that the First Pillar, The Right Arm, (RA for short) is not with them, for his sheer size would suggest his few metric tons of absolute strength would be a task much too difficult for the old and rickety-rackety bridge to support. Yet…it gives rise to his obvious absence. Where has the First Pillar gone? FoS: How is the arm. Farmer: Much, much better Sir. Again, Tyvm. FoS: Hmm, don’t worry, this bridge leads to the tunnels, it seems weak, yet I have never seen it give way, plus, you are like…what….130 pounds soaking wet? Hahahe ugh (coughs, into his ragged clothes, revealing a little bit of blood on his shirt) hehe, ugh.cough…cough kaash..ugh. Farmer: Where has the First Pillar The Right Arm gone to? Are you ok? FoS: The Right Arm took a beating back there. You know...the Pillars are not invincible. Even we need time to recuperate, aye. I myself will head back to rest, yet with the state of your clothes I wanted to lead you to the Third Pillar before I take leave. As The Farmer and FoS cross the bridge, the Second Pillar FoS, stops and takes a deep long breathe, leaning on his green staff, as the green staff begins to wobble, he grumbles and replaces it with a longer staff…scythe of sorts…red in color. The area looks similar to the Arena, yet only larger and darker as the sky is not accessible…and the sand here is much more firm, and orange in color. FoS: He spends most of his time here as well. Farmer: Tis a shame as he was swayed, as well as Sick…to join the Blind lady I feel as they were swayed by greed into the hands of evil. FoS: Things are not so black and white as, whatever commenced at the Arena training. Farmer: What do you mean? FoS: Just…just have an open mind when you encounter the Oracle. Understand that in the tunnels, things are not so black and white. FoS: Open mind. Just…Open your mind. And…don’t think so much. Wait here at the mailbox. FoS (Father of StoneVale) then quickly utters a prayer of some sorts, for the Right Arm….the Farmer catching on late, assumes his stance, closing his eyes and placing his weapons in his back pack. As the Farmer open his eyes, FoS seems translucent, indicating his exit. Dust off the hard, orange ground forms a whirlpool, moving counter clockwise around him, kicking up sand and trash on the ground as a soft glow emits from his frame. As the farmer squints to avoid dust in his eyes, a pamphlet flies off the ground and hits the Farmer square on his face obstructing his view. As the Farmer reaches to pull the yellowish paper off of his face, FoS has vanished and Lady appears, floating on a wooden staff towards him, with a carefully carved dragonhead on the front end. A lady floats on her staff close to the Farmer. Leaning backwards, the Lady Sits upright on her staff and kicks her feet outward in a manner only elite Olympic gymnasts could pull off, slowly, methodically every motion of her is synonymous to well life long trained ballerina. Her staff moves on its own, sliding underneath her She, in kicking her legs apart and forward, leaps, from a straddling position into a backward summersault …unusual lightness of weight is displayed as her flipping backwards seem slow, purposeful and slows down even further as she spreads he arms out side by side until she rotates all the way around through her summersault and lands., one foot in front of another perfectly on her staff as if it were a balancing beam…like a young magical Marry Lou Retton, standing on her staff. Without any observable effort, she dismounts off her staff just as it dissipates into nothingness as she spread out arms serve as wings of sorts, body forming a T shape and she floats a few inches off the ground in preparation of her landing., Her momentum brings her to a slow levitating movement towards the Farmer as if she was moving along a ground escalator found in airports. Her movement as if she was in full control of every sub atomic particle within and around her. The ladies landing on the ground is a purposeful as well rehearsed as a landing of veterans at the Cirque du Soleil. At a complete stop, her Black veil kicks forward due to momentum and for a split nanosecond reveals her face…. the Farmer is given perhaps one of the greatest visions of absolute and pure beauty he has ever seen in life. The Farmer grabs on to the yellowish paper that struck his face as if he is holding on to his life, magnify the sensations of the harsh paper in order to force himself free out his trance that her beauty trapped himself in. At this point, the Farmer is fully aware that his glances may appear to be rude, hedonistic and even barbaric at this point. Before the Oracle’s Viel moves back into the position of cover her face, Her eyes hold a piercing, penetrating, yet calm. Stance. The farmer feels as if they were old friends beyond the notion of time and space…. a protective entity and a supporting factor for a thousand ions in reverse and in the future. Her strength reads off the charts, yet at the same time does not encompass the fear or intimidation of others of her strength. The Farmer almost automatically and without control straightens up stiff and salutes, nearly knocking his head backwards in all of his awkwardness,, knowing that even in his deep ignorance this woman is one of high stature and should be treated as royalty, even though she does not demand it. The Oracle: Understand that the motions and actions of Danu are purposeful as your Axe training with the Double Dragons 40 lvls prior. Now…if you take this as a given, everything before you and after you has happened for a reason…even that flier that hit you in the face precursory to my entrance. The Oracle: Farmer, could you read to me what is on the backside of the paper? The Oracle: Hmmm. That is a random…yet is truly random? If we presume that everything happens for a reason, than I wonder why that parchment struck your face. As you wonder as well. Hmmm. The Oracle: Too many thoughts occupy your mind, preventing you to formulate concrete answers to each one. Smh. You seek Justice, yet you are novice indeed. You wonder how you will ever be a Pillar, and if your desire to be a Pillar is egocentric, an excuse for treasure and power under the cover of being a bearer of peace. My oh my your cognitive dissonance is as polarizing as a busy Tavern setting with the God of War being seated a table adjacent to a Vulture. The Farmer, takes a step back,…more confused than ever as the Oracle begins, time after time, predicting his thoughts, some even before they reach the self awareness portion of his own consciousness. He becomes, afraid, nearly slowing his mind down, as he feels naked when the Oracle appears to have more access to his brain than himself. The Oracle: That’s right…slow down some. The Oracle: Now that is out of the way, that pamphlet,,,why did it hit you? Farmer: I haven’t a clue? The Oracle: Perhaps to expose the cognitive dissonance in your mind? Hmm? Farmer: What is cognitive dissonance? The Oracle: Why it is the human condition. The things that give rise to feelings in which you agree and disagree with. The built in contradictions that are apart of us and the world around us. As it is obvious that you want Justice for Danu but you also want Power…yet Power has long been associated with things that prevent Justice. You are confused indeed hehe. (Looking around). In a way the Tunnel here is a physical manifestation of Danu’s dissonance. The Oracle: For instance, your experiences in your youth had provided you a social construct that those who follow your God of War and those who are in their Prime are opposed to eachother. As the Farmer squints his eyes into focus, he sees a Flying dragon reeling in pain moving, moving slow…towards an Archer. The Archer almost appears to be flying the dragon like a Kite, each arrow penetrating the dragon, making it more angry and focused on the archer, yet moving too slow to catch up to her. Behind the dragon, several patrons appear to be beating, cutting slashing its sides and tail section and others farther away send fire and ice towards the dragon, for this dragon who is more powerful than each one, yet confused and thus inferior by the well organized strategy employed by the collective. The Oracle: You seem astonished by the strategy in killing the dragon, yet you overlook the most important aspect of the strategy….look closer…look at who….rather than how…they are fighting young Farmer. The Oracle: The Father of StoneVale said not to think so much, and to have an open mind no? Farmer: How did that happen? The Oracle: Understand that the politics of Danu, are the ..well..politics of Danu….the people are the people. Maturity purges the social constructs that keep us apart….and paradoxically…the challenges before us, the harder they are..(Nodding towards the dragon) seem to bring us together. The Oracle: Yet, this is a small glimpse of the possibilities of formulating Justice, the idea you lust after, for your true test will arrive once you are strong enough for the resetting wars. The Oracle: Indeed, for your resiliency once you quest to reach 150 without Lix is actually not an ending goal, it will be your birth to implement what you have learned..knowing Justice is one thing, implementing it is entirely another…. Farmer: (holding the pamphlet reading it again)I am unsure..perhaps this Magistrate's strategy of finding truth to lead us to Justice is a clue of some sorts… Where is this Veritas and the Magistrate? What does this mean? 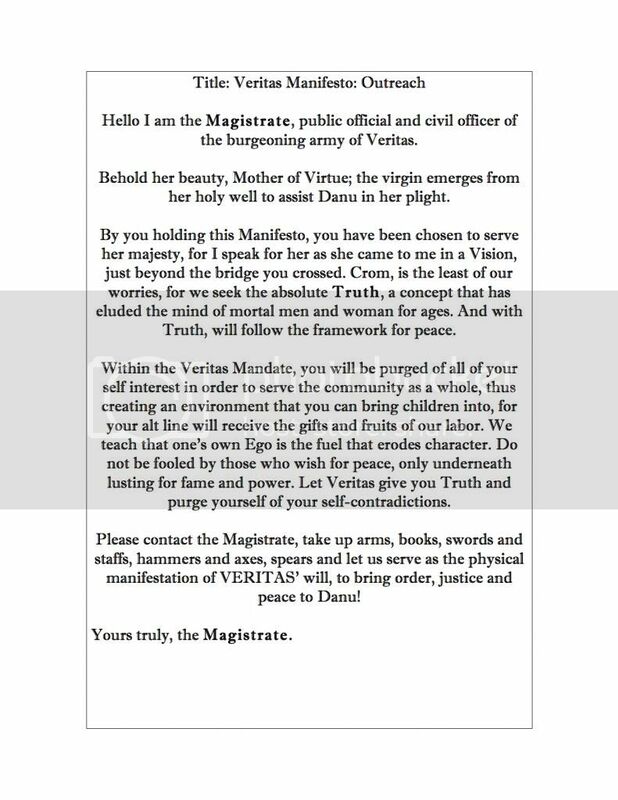 The Oracle: The Magistrate is now with those who are in their Prime, and Veritas, well her ideals and manifesto, went back into the holy well due to the patrons of Danu not being ready to accept the truth due to undying and lasting grudges.. The Oracle: Legend has it…after the Magistrate destroyed all of traitors in Shalemont…he was awarded a lix. He took one sip of the potion and gasp…spitting out the fluid due to its synthetic taste and used a fettle cap mushroom to wash out his mouth and never lixed again…he still searches for truth, waiting for Veritas to reemerge. You may be lucky enough to run into the Magistrate, one of the few in Danu that is held in high regards with opposing factions here. But I digress…you came here for clothes, your thoughts are so boggled it interesting to read…. it is many, many colors that are in your mind. The Oracle: Emotions, if happy was Yellow…and sad was..Blue..what does that make when you put the two colors together? The Oracle: Yes, but if anger was red and love purple…what does that make? Farmer: Um…I am not sure…brown? The Oracle: What if all colors were laid superimposed on each other? The Oracle places her hand in the direction of the mailbox, to which opens on its own and a Black Hat….and Black Shirt, folded neatly float onward, towards the Farmer. The Oracle places both hands outward emitting a blue aura, and in doing so projects a map of sorts on a large rock, behind the Mailbox. The Oracle: I saw this in your mind. So, is this what you see Danu as? The Oracle: You have distaste for Clan A? The Oracle: Chosen a path of isolation…causing suffering for others? 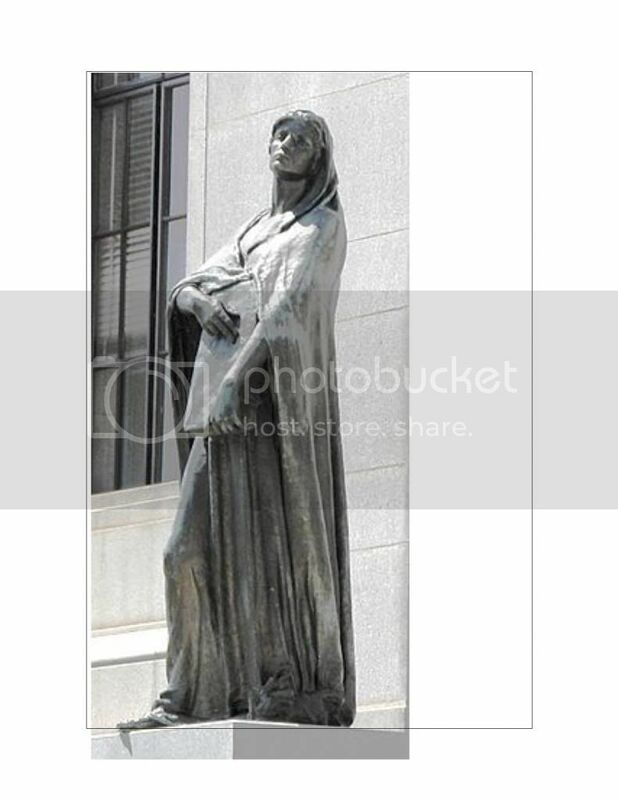 The Oracle: Have you sought the historical context of Clan A? Have you not uttered yourself that those who suppress others are usually in more pain than the suppressed? Farmer: Yes but that would mean an impossible equation? The Oracle: Then…what of this equation? Farmer: It would suggest that those in their Prime need to be given justice as well….that they need to be saved before anyone else? But how is this possible? How can those in their Prime be in more pain than those who they sink their swords into???? The Oracle: (chuckles) You will have to figure this out on your path, if you are to truly find Justice on Danu. Btw why is that slice of the pie separated again? Farmer: Oh it is because the other two work together and that one chooses to work alone? The Oracle: Chooses? How does one choose to be alone? The Oracle leans towards the farmer…in whisper. Perhaps there is no bad and good as you see it…perhaps the bad part of the social constructs of Danu is the space…separating that clan from the others, perhaps the “bad” is the challenges that keep us apart. The Farmer walks over to the large rock with the projection, placing his hand on the Rock, over Clan C feeling its warmth. Farmer: Well…perhaps I do not understand what Bad means…but with all due respect…I know what good means. Farmer: When I had nothing..(looking at the ground) when I was robbed and exploited due to my ignorance in Danu economics, casted aside and alone...twas the God of War who saved me. Forgive my emotion, but she saw something in me.... a possibility...that I could not see. She assumed me to be great...and it started a reciprocation of sorts....I started to believe in myself..because she believed in me beforehand...I am forever in debt to her, and even in defeat, may that place my grave in front of her as I serve to protect her, for now...forever...ad even in the after life. If I know one thing out of a universe of ignorance, I know that this ...(begins to tear) that this is a good thing. The Oracle's veil over her face appears to twitch, indicating a smile of sorts. Farmer: The God of War and her Army gives many chances to those who make mistakes, of greed and anger. Some of those who I fight with have had reputations of being horrible persons in the past. She has a unique eye of seeing the good in everyone, and sometimes it turns bad people into good people because that start to believe in what the God of War sees within them rather than what tyranny they have produced before joining. This, I believe is a goodness. And so I ask you…if you have the ability to read minds…and perhaps see momentarily in the future…what is Justice? The Oracle: Heh, you are not the only one with journals…yet this is not a journal this is a cook book. The Oracle , fumbles through the pages of a the book stopping 3/4th through the book. The Oracle: Ahh yes, Justice…the ingredients are as follows. The Oracle: Does it really make no sense? Farmer: Even if it did? Why a torch…when you already have a Sun? The Oracle: Indeed…the Sun and the Lighter do appear to be similar…perhaps the lighter is needed to set something a Blaze. The Oracle looks north…her veil twitches indicating perhaps another smile under near the material covering her face. The Oracle: There seems to be a storm coming…remember our conversation…remember the Impossible Dream of togetherness. A rough ride is ahead…yet if you truly are to find Justice, it will be on a path unbeaten, thus unsmooth and uneven. For now…I must go. Actually we must go. Farmer: Where to? The Father of StoneVale told me that you rarely leave the Tunnels. The Oracle: Indeed. Therefore if I am to take leave…tis of significance. Just then a deep roaring sound emits for the Castle….the farmer starts to feel a sharp pain in his chest…trying to turn around…yet cannot to keep balanced on his staff. The Oracle: Do you really want to know…really? Farmer: What? There is a Fourth Pillar? GJ man - would love to see all of those toons sitting at a table in the tavern to figure things out. Also good job in addressing some of Magustra's earlier comments. It takes a great deal of humility to shed pride in order to take on advice, and can be a rare quality to find nowadays. This latest instalment is an excellent riposte to some well-intentioned critique. It shows a greater sense of self-awareness, but I particularly the like the fact that the writer does not feel the need to lay claim to holding all the answers. The conflicts of character are acknowledged, yet there is acceptance that they as yet remain unresolved... This a good thing indeed. The moment a person believes they know all there is to know, and shut off their ears, is the same moment they turn aside from a path of enlightenment. Wisdom is not a destination, it is an ongoing journey, and there are some well-placed steps laid here. I still think that greed is too simple a scapegoat to point the finger at, and in terms of explaining the divisions that are prevalent in Danu. It may permeate through most things, but is more a symptom than the condition. People for the longest time have been tribal animals, and banded together in groups for survival and protection. It is part of a basic imperative... An instinct for self-preservation and the notion of survival of the fittest. This would in turn lead to things such as control, power, and greed, but as I say, these are largely symptoms. It's these instincts that can give rise to national, racial and religious conflicts. It is also probably one of the reasons why we feel so compelled to offer our unwavering and somewhat irrational support to the particular sports franchise whose badge sits so close to our heart. That is just part of the story though, and it is far more complex than the meagre thoughts I have laid out on the matter. It is clear you have taken great steps to broaden the vantage point from which you gaze upon Danu, and think maybe the above might help you somewhat as you attempt to peer into the gulf of space which you describe as separating the people thereof. What you may want to consider though, is not just the differences of the clans, because these can be largely situational, but the common traits that bind all people. I dont even play on Danu and still I check the Danu forum for updates in this journal..great work! Farmer. WRITE. A. BOOK. You write like you are the world's most famous and talented author! I love Danu! glad I'm on it!